Author of the Greywalker paranormal detective novels. Kat is a former theater brat and non-fiction editor who currently lives on a boat in Washington state with her husband and the ghosts of ferrets. She also rides a motorcycle, shoots target pistol, and makes trouble. 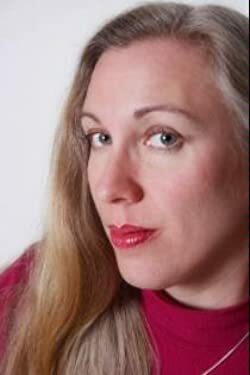 In the past, she helped develop a fan-built PC game (T2X), wrote a short horror screenplay (The Glove), taught English Country Dance, fenced epee, broke both arms, wrote about diamonds, ate alligator (no, she didn’t kill it), sold dead lizards, pretended to be a nun, sang, and has been kidnapped by pirates! (well… maybe not pirates….) Read excerpts of the GREYWALKER novels at Kat Richardson’s website. Click here for more stories by Kat Richardson. Greywalker — (2006-2014) Publisher: Harper Blaine was slogging along as a small-time P.I. when a two-bit perp’s savage assault left her dead. For two minutes, to be precise. When Harper comes to in the hospital, she begins to feel a bit… strange. She sees things that can only be described as weird-shapes emerging from a foggy grey mist, snarling teeth, creatures roaring. But Harper’s not crazy. Her “death” has made her a Greywalker — able to move between our world and the mysterious, cross-over zone where things that go bump in the night exist. And her new gift (or curse) is about to drag her into that world of vampires and ghosts, magic and witches, necromancers and sinister artifacts. Whether she likes it or not. This is not a traditional review of Kat Richardson’s Greywalker. I’m going to talk instead about the technique Richardson uses to introduce her paranormal world and her main character’s magical power. Richardson’s premise is that abutting our dimension is a transitional dimension known as the Grey. Some creatures live in the Grey; some come through it from other places. Vampires, werewolves, ghosts and ghouls move about freely in it, and can shift easily from the Grey to here. 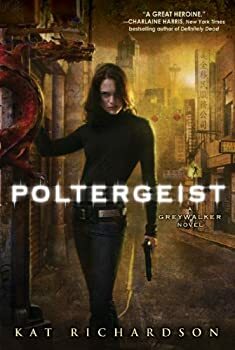 Poltergeist is the second Kat Richardson GREYWALKER novel. A few years have passed since Greywalker, marked by the growth of Ben and Mara’s son Brian from a babe-in-arms to a talking toddler, and Harper Blaine’s increasing proficiency in navigating the transitional dimension next to ours, called the Grey. Harper clinically died for two minutes, and during that time, “crossed over,” triggering this strange ability. 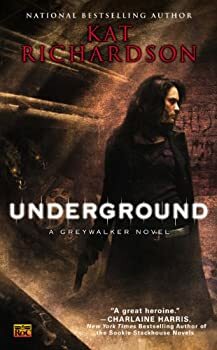 Underground is the third in Kat Richardson’s Greywalker series, which features Harper Blaine as a Seattle private investigator who can see the “Grey” — the borderland between reality and magic, life and death, past and present. Harper gained this ability when she died for two minutes in an attack by the subject of an investigation. 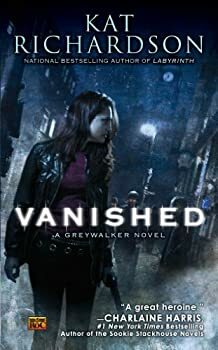 The fourth book in Kat Richardson’s Greywalker series, Vanished, is the best in the series so far. Harper Blaine, Richardson’s private investigator protagonist, gets a telephone call from an old boyfriend — not necessarily an unusual event, except that, in this case, the boyfriend happens to be long dead. He hints that there is much that Harper does not know that she needs to find out, quickly, and encourages her to come to Los Angeles to look into her past. 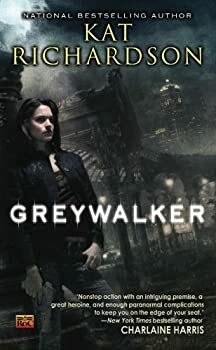 Kat Richardson’s Greywalker series is absolutely noir and it reaches the darkest tones ever in the fifth book, Labyrinth. In fact, this book is unrelievedly dark, scary and suspenseful. Richardson topped herself with the fourth book in this series, Vanished; now she has topped herself yet again. 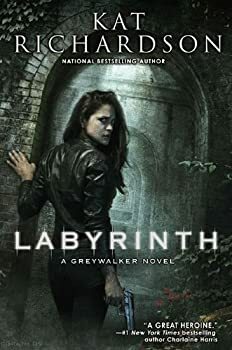 Kat Richardson’s GREYWALKER novels reached a crescendo with Labyrinth, the 2010 entry in the series. It is not surprising, then, that Downpour, Richardson’s newest novel, feels anticlimactic. How does an author top killing and resurrecting her main character? 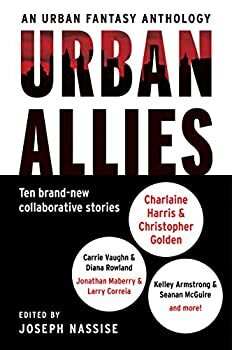 It’s especially difficult when the character comes back a bit less than she was in the last book; Harper Blaine’s connection to the Grey in this book is considerably weaker than it was. But Richardson has surprises in store for her readers, as usual. Kat Richardson’s GREYWALKER series perfectly unites the classic private investigator mystery with the paranormal fantasy. The mysteries are rigorous within the rules of the paranormal realm Richardson has invented; her background research is broad and utilized well; and her characters become deeper and more interesting with every new novel. 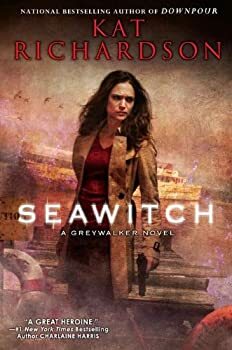 The latest in the series, Seawitch, gives us insight into the character of Detective Rey Solis of the Seattle Police Department, who has been a pain in the side for PI Harper Blaine in the past, but who becomes more of an ally and even a friend.